Congratulation Leslie Mohr! I'm sure Superstytion will make an outstanding Western pleasure horse for you. This is an awesome colt! He was born on Friday 13th so his name was easy. 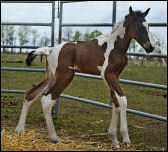 Superstytion comes from one of our best Sporthorse pinto mare, Canadian Red Rose. 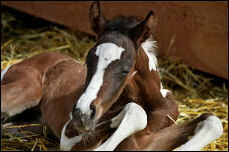 His maternal sister is 2010 Canadian National 1/2 Arabian Futurity Res Champion Filly! His maternal brother is 2012 Canadian National winner in Halter Futurity and Sporthorse In Hand as well as 2012 US National winner in Halter & Hunter Futurity. Superstytion is Sweepstakes Nominated and entered into Canadian Nationals, Region 17 and Parkland Futurities. The last three foals this mare has produced, have been over 16 hh so I expect his colt to be no different. Just as expected, this is an outstanding individual. Superstytion DF has had a great show year as a yearling. 2012 Parkland Futurity Champion Half Arabian Colt/Gelding. Congratulations to Leslie Mohr and Superstytion on their wins!